(...or, 'World of Cats', as I like to subtitle it). My latest painting was created in order to be reproduced as a jigsaw for Gibsons Games. At the time of writing this blog post I have just approved the box cover for Peeping Tom. The jigsaw is now in production and will be published in January 2016 by Gibsons. Ivory Cats is delighted to announce the release of 'Peeping Tom'. I imagined a setting where cats had a house and garden all to themselves to play in. I shortlisted sixteen of my cats to take part in this scene, each one appears to be looking for something. For their interest I have featured 3 small Tortoiseshells (catty butterflies! ), roses from Kitty's garden, herbs from Graham's and tomatoes from Hilary's. The cats all seem to be looking for hidden insects and interesting sights and sounds. They have not yet seen the sowbug, ladybirds, snail, frog and birds. Also hidden is a tiny turquoise bead - because I would love to have found it there myself! Can you spot the real Peeping Tom among these sixteen cats? That is for you to decide. I love doing jigsaws. I wish I could send this one to my grandfather who taught me to love them many years ago. 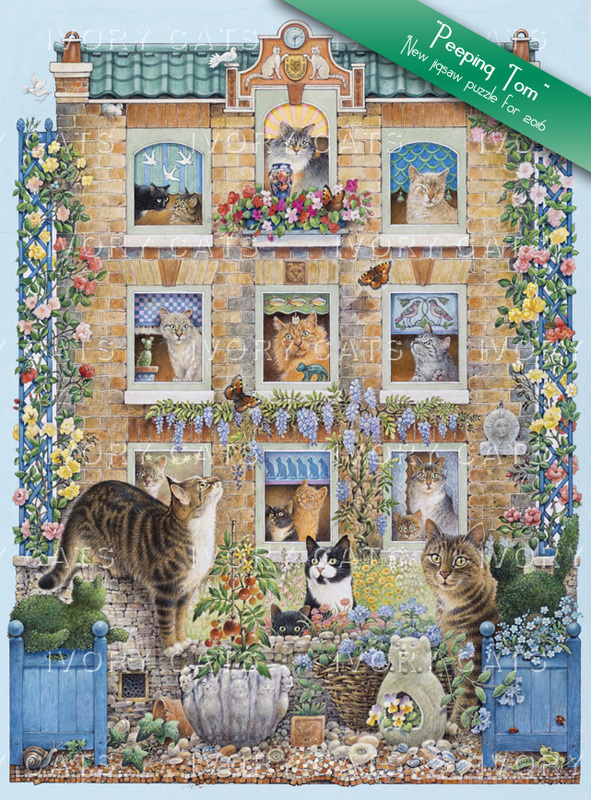 Happy puzzling to everyone who makes this jigsaw, from Lesley and the Cats.